can u bake me the same dessert and ship it to me? in the desert that i live, desserts are god-sent during summer, what say? hey friend, i know it was just a wonderful poem..know u r a happygolucky guy...cheers always...wishes..
That's a cookie? I am afraid how big the cake would be?? 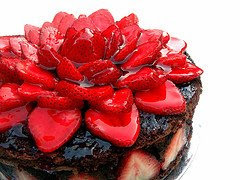 i'm not too much of a junk food eater, but the strawberries look good!! i love strawberries, actually any kind of fruit except pears.